I have always been a fan of the National Geographic magazine; taking me away to the far reaches of the world, seeing sights that I may never see, allowing me to pour over maps showing the geography of the area. A piece of National Geographic is coming to the Okanagan, to Liquidity Wines specifically, where the National Geographic Photo Ark will be displayed. It will only be here for the summer. Details of the Photo Ark are below. Thanks to Liquidity Wines for letting me know about this interesting exhibit. I hope I will have time to make it to the Okanagan this summer. Their press release is below. This summer, Liquidity Wines‘ tasting room walls will be adorned with images from the National Geographic Photo Ark – a compelling series of photographic portraits that capture the beauty of Earth’s diverse species. “The goal of the Photo Ark is simple: show what’s at stake, and get people to care – while there is still time,” said Joel Sartore, National Geographic photographer and founder of the Photo Ark. The National Geographic Photo Ark is an ambitious project committed to documenting every species in the world’s zoos and other wildlife sanctuaries – inspiring people not just to care, but also to help protect these animals for future generations. A compelling and visually powerful project, the National Geographic Photo Ark aims to photograph species before it is too late. In addition to creating an archival record for generations to come, this project is a hopeful platform for conservation and preserving species around the world. 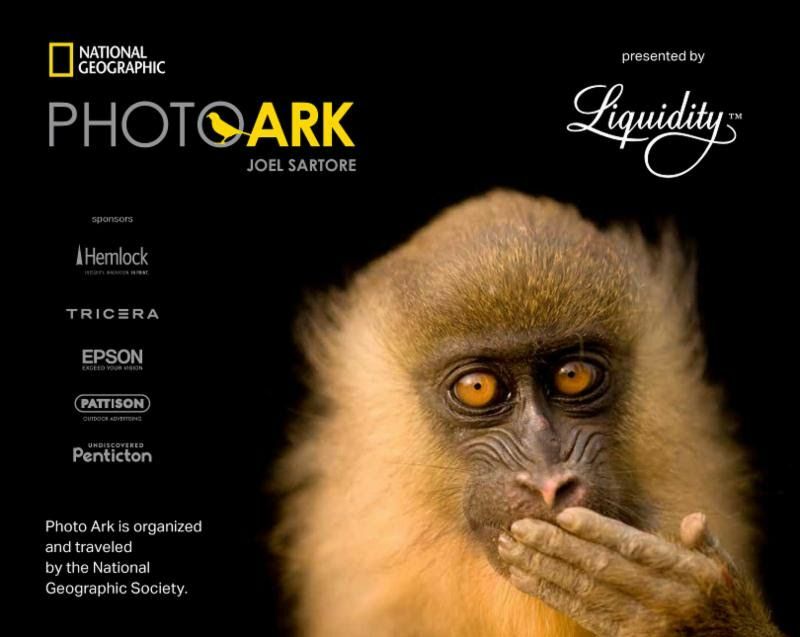 The National Geographic Photo Ark will be showcased through multiple platforms, including a travelling exhibition that will open at Liquidity Wines in Okanagan Falls, B.C. on June 23. Featuring Sartore’s captivating images, the exhibition will be on display until September 3, 2018. Sartore estimates the completed National Geographic Photo Ark will include portraits of species representing several animal classes, including birds, fish, mammals, reptiles, amphibians and invertebrates. In what will be the largest single archive of studio-quality photographs of biodiversity ever, the National Geographic Photo Ark continues to move toward its goal of documenting these 12,000 species in captivity, thanks in part to Sartore’s enduring relationships with many of the world’s zoos and aquariums. These iconic portraits have captured the imagination of people around the world and have even been projected on the Empire State Building and St. Peter’s Basilica in Rome. The light-filled tasting room at Liquidity provides the perfect canvas to display the Photo Ark’s compelling portraits. Organized by the National Geographic Society, the winery’s exhibition will feature more than 50 of these inspiring photographs, and provide visitors of all ages with an opportunity to learn about the project, its mission and conservation efforts.